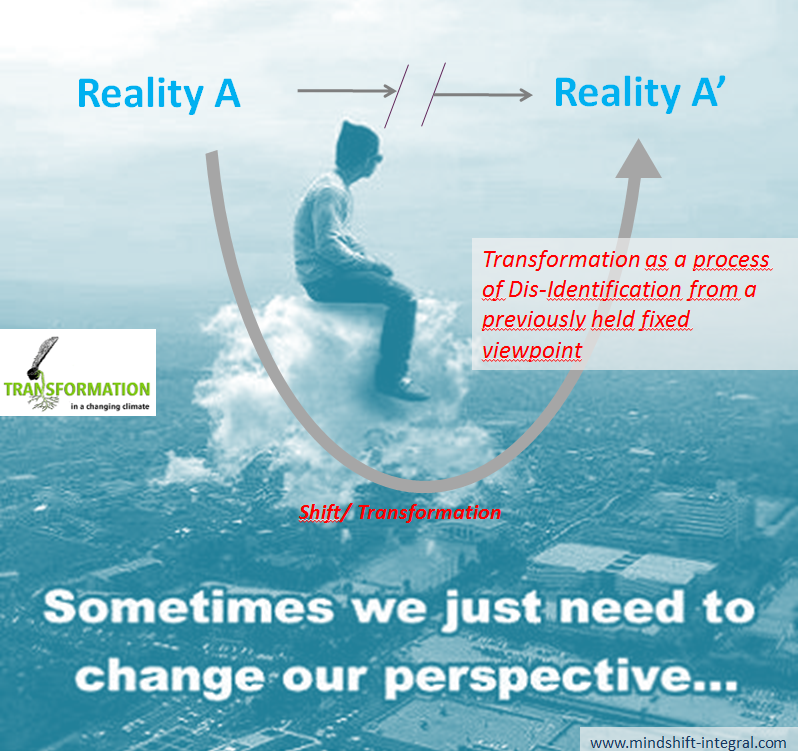 Group transformation processes, much like individual transformative processes, follow different phase with distinctly recognizable stages. According to these patterns, a skilled coach/facilitator can keep the individual or the group in the process. The main task is to counteract the conscious or unconscious attempts to escape or to sabotage the process because of phenomena that are considered uncomfortable, irritating or even painful (e.g. Scott M. Peck’s “Groan Zone/Authentic Chaos”/ R. Kegan’s “Immunity to Change”). Individual processes can take the form of individual coaching, intensive retreats in self-leadership with awareness based technologies. They are geared towards reintegrating disassociated parts of the self-system or the dis-identification with mapping errors in the meaning making system of the individual.Group processes can have different intentions that go from more coherence in teams, integrating pathologies, towards more authentic participation, innovation and other emergent properties. Most of the time they are not automatic and require facilitated and committed process work with the respective team or group. In an ideal case, group facilitation requires only those minimum elegant structures that keep the group in process while resisting the temptation to go with any of the easy solutions that inevitably pop up along the way, while constantly scanning the quality of presence that is arising in the group and mirror that back. This would ideally also require a kind of ‘process literacy’ of the participants; the ability to distinguish between the self and the (power) moves of identity. The phases and stages of these processes along with the phenomena normally showing up are pictured above. For further reading on the dynamics of group processes see Bonnitta Roy’s article in Kosmos Magazine or this chapter published on group processes. The process traps and the tools and method to counteract escape mechanisms are pictured in Slides below. Please note that the representation with the U-Figure is oversimplified, these processes are non-linear and can’t be followed as a recipe (e.g. “step 5: find deeper meaning and purpose”.) Each phase is emergent from the prior one and can’t be planned, forced, constructed, or jumped. The figure U makes only sense as a coherent view in hindsight and thus differs from the majority of Theory U applications. While both individual and group/team processes require time, place, effort, training, personal commitment, nurture, practice and guidance, they have a place in adult – , leadership – and team development as well as innovation training, but not for scaling and shifting larger collectives or organisations. Pictures 4 and 5 show how working with large scale differs in its approach. Complexity thinking and cognitive science deliver the design principles for sensemaking approaches (see Prof. D. Snowden’s work/Cognitive Edge). Here, we work with triggering people into paying attention (cognitive activation) while they volunteer to deliver real, self-signified, and real time data about what is actually happening as opposed to what should be happening. The shift of the whole collective (change) is an effect of the sum total of all micro-shifts of everyday behaviours and attitudes in a more generative direction, toward an ‘adjacent possible’. a) with this approach no one has to go a developmental growth process and are allowed to be who they are and have the values they have, while at the same time shifts and change are possible, and they can chose how. Thus, sensemaking is complementing adult development while counteracting the developmental bias seen in many (integral) change initiatives, where larger scale change is seen almost exclusively through the lens of growth to higher levels of consciousness as the only way to solve complex problems. This attitude has a built-in arrogance that, sure enough, creates pushback and resistance to change. b) it scales, with immediate impact, in real time. This is exactly what we need. This blog was previously published here. Categories: Blog post, Praxis Paper | Tags: change, collective insight, collective shift, culture hacks, culture shift, immunity to change, microshift, sensemaking, Theory U, Transformation, traps | Permalink.